Carbon nanothreads, the one-dimensional carbon nanomaterial synthesized slow compression of benzene to 20 GPa followed by slow decompression to atmospheric pressure, contain almost exclusively fully saturated sp3 carbons, with a C/H ratio of about 1:1. Despite this key information, the exact structure of the carbon nanothread remains uncertain, and is a topic of both experimental and theoretical research in EFree. One key step in correlating structural models with experimental observations is determining what structures are possible, and this not only takes into account the constraints on possible geometries, but also the mechanism for the formation of the nanothread from isolated benzene molecules. New work from the Cornell and Penn State groups in EFree has focused on determining the structures of partially saturated intermediate polymeric structures that could yield the nanothreads. 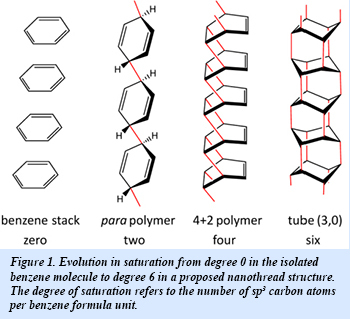 Defining the number of sp3 carbon atoms per benzene formula unit as the degree of saturation (Fig. 1), a set of isomers for degree-two and degree-four polymers can be generated by propagation of partially saturated building blocks. In total, eight degree-two and 23 degree-four polymers have been determined as appropriate polymeric precursors, subject to constraints of unit cell size and energy. 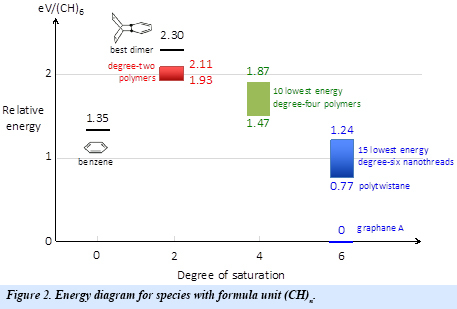 The database of structures containing degree-two, degree-four and degree-six polymers now allows the energies of these polymers to be compared to those of other (CH)n species, including benzene, benzene dimers and graphane A (Fig. 2). While the 15 lowest energy nanothreads are more stable than the reactant benzene, the two types of intermediate polymers are not. This suggests that a barrier has to be overcome in the process of nanothread formation, and that the nanothread formed should be a kinetically favored product. Delineation of polymer structures and corresponding topological pathways can now serve as the basis for understanding the kinetic barriers for nanothread formation, moving from a knowledge of what structures are possible to a prediction of what structures are probable [B. Chen et al., J. Am. Chem. Soc. 137, DOI: 10.1021/jacs.5b09053 (2015)].